This week, I went to Edinburgh with a friend to visit a friend who’s studying there for a year. It is my first time in Scotland, but definitely not my last one. 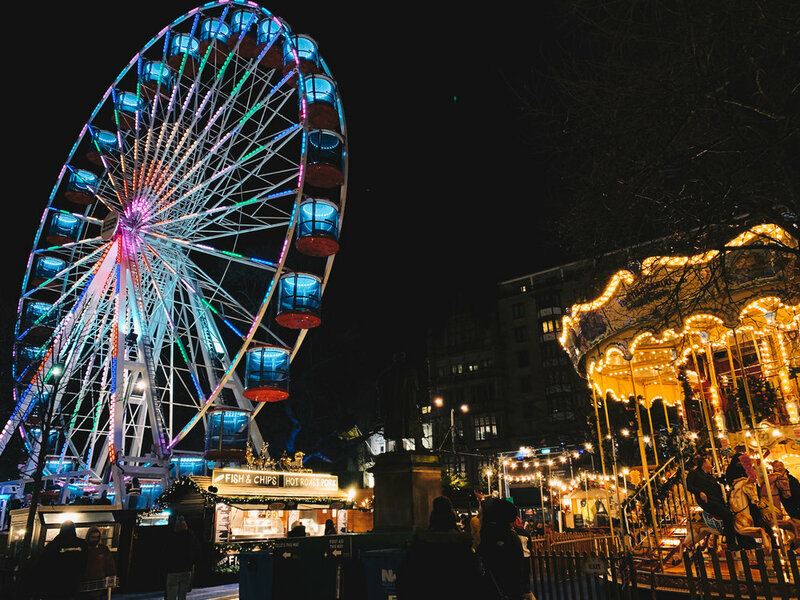 Even though the journey to Scotland was a rough one, due to flight delay and storm during touchdown, we decided to go to the Christmas market right away after dropping of our bags and also during the rest of our stay we went there nearly every day until now. The most beautiful Christmas market of Edinburgh is located at Princes Street, one of the most famous streets of the city. If you expect a market like the ones we have already described in our previous blogposts about different Christmas markets, you’ll be disappointed, but not because it’s not a pretty one – believe me it is – but because it’s more like an amusement park with lots of carousels, rides and attractions. It’s more of an event than a market but it definitely has flair. The market is subdivided in four different floors, with the first one being mainly focused on the rides (it’s so shiny and colourful! ), the second and third on food and goods that would be perfect presents, like scarfs, mittens, jewellery and handcrafted items and the fourth is perfect for kids and offers rides that are more suitable for the little ones than the ones on the first floor. I definitely bought a big part of this year’s Christmas presents. And contrary to my other experiences, the goods mostly are even cheaper than in stores! For example, I bought lots of scarfs made out of Scottish lamb wool, that have such an amazing quality and were 5 pounds each - nearly everyone is getting one like that for Christmas from me. Despite being in the city centre of a big town, the Christmas market is really calm and cosy. I guess it’s mostly because of the different floors that it does not feel overcrowded. And don’t get me started on the food! The stands offer you all great things food, from British cuisine, to German Bratwurst and pancakes and of course mulled wine and punch. You won’t leave hungry! Oh, and while you’re there, check out the beautiful lights’ of George Street where the beautiful Silent Light takes place! I know this is a rather short blogpost - shorter than you’re used to - but for me it’s important to enjoy the time I spend with my friends instead of focusing on blogposts, especially when I’m visiting a friend that I haven’t seen in a long time and which I won’t see for some months. There’s more time for writing after my trip and I can’t wait to tell you everything about my time in Scotland very soon on the blog and don’t forget to check out our other reviews of Christmas markets! Only 4 more days until Christmas! Enjoy the time with your loved ones!